Bacon makes everything better. Can I get an ‘Amen’?? Seriously, veggies, main meals, even desserts. Bacon isn’t just for breakfast anymore. And I’m doing my best to get the word out. Feel free to share this PSA, with anyone and every one you know. My family looks forward to just about any meal that includes bacon in virtually any form. I once had two of my sleeping teens run out of their rooms at almost noon. Did I mention teenage boys sleep like the dead? They also rarely wake before noon, unless forced to, and never happily or voluntarily. But two of the sons were roused from a deep sleep just by the smell of it sizzling in the kitchen. They were not happy with me when they discovered I was not in fact making it for a late brunch, or even as apart of their lunch. Nope, it was for a recipe I was developing for the blog. And not even a recipe they were going to enjoy, that. day. Unhappy is an understatement. Oops. I did try to convince them it’d be worth the wait though. Their droll stares and eventual eye roll told me they weren’t impressed. They sure dug into this Maple Bacon Waffle Bread Pudding though when I served it for dinner. 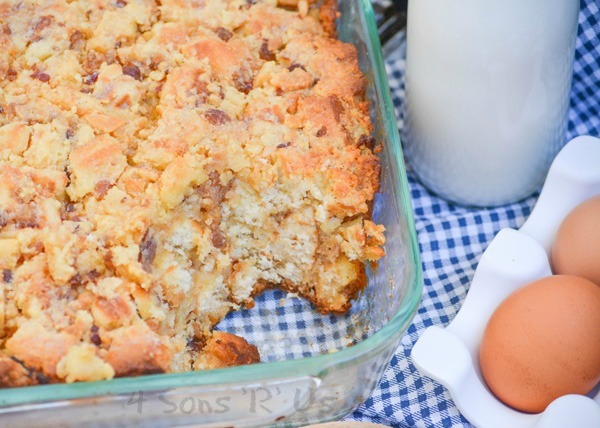 And yes, this breakfast-flavored bread pudding is hearty enough for dinner and tastes great any time of day. 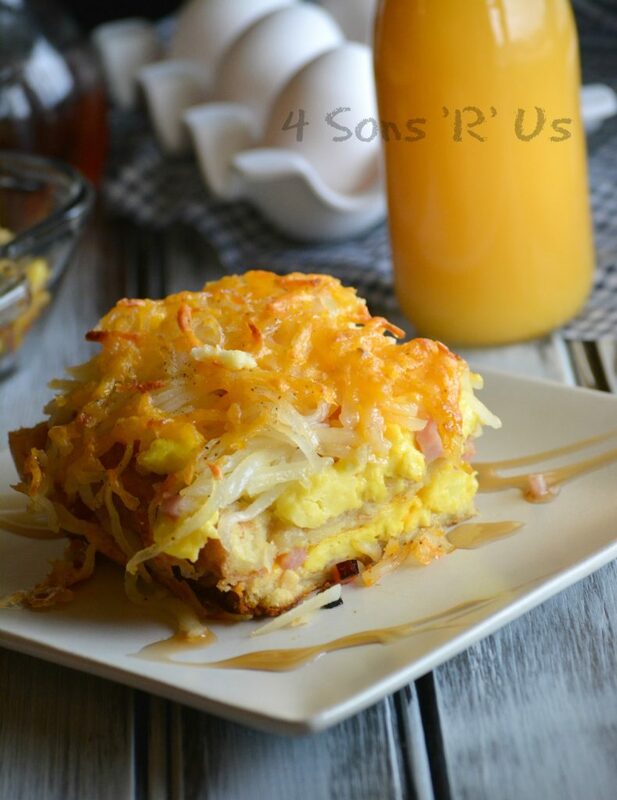 It’s always a hit at family brunches, and it’s a pretty easy dish to throw together. 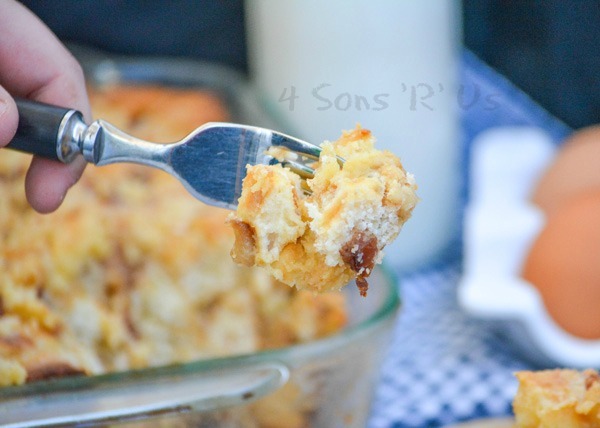 It’s essentially a casserole-style dish, and those are some of my favorites. What’s not to love about stirring a bunch of ingredients together and having them bake up into an epic meal. 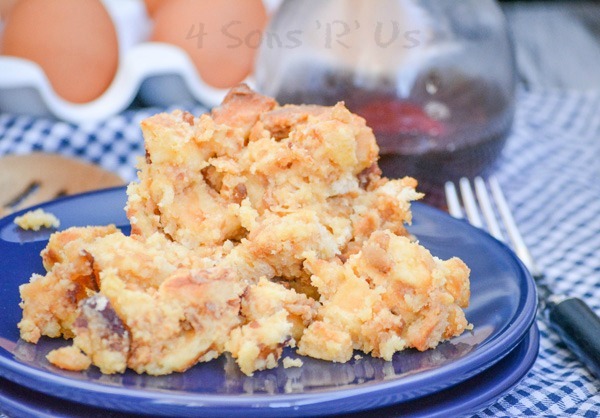 This Maple Bacon Waffle Bread Pudding is sweet and savory, all wrapped up in one bowl. Chunks of fluffy waffles are soaked in a sweet cream, maple syrup bath. 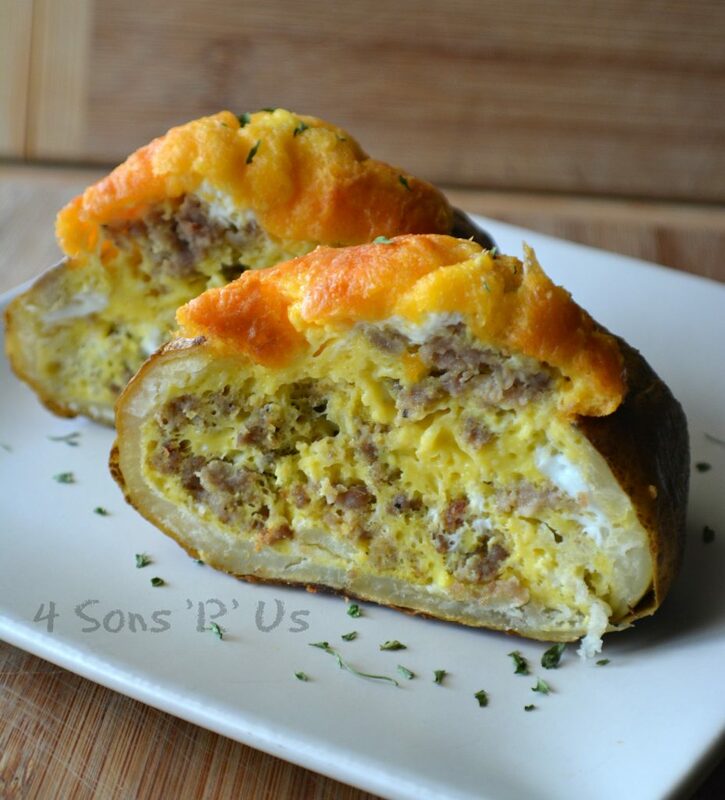 Studded with crisp, crumbled bacon the dish is baked to crisp perfection. Each bite is a texture and taste sensation. A little bit sweet, a little bit savory. 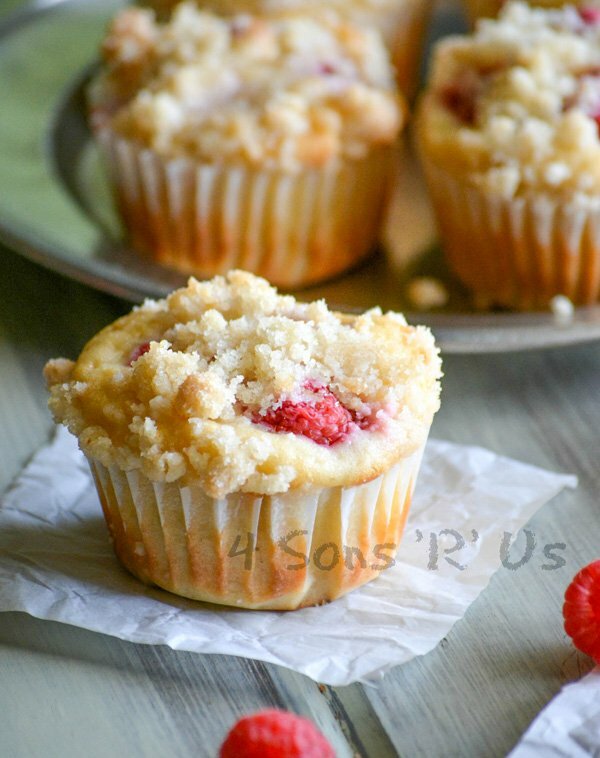 Crunchy on top, soft and crumbly on the bottom. 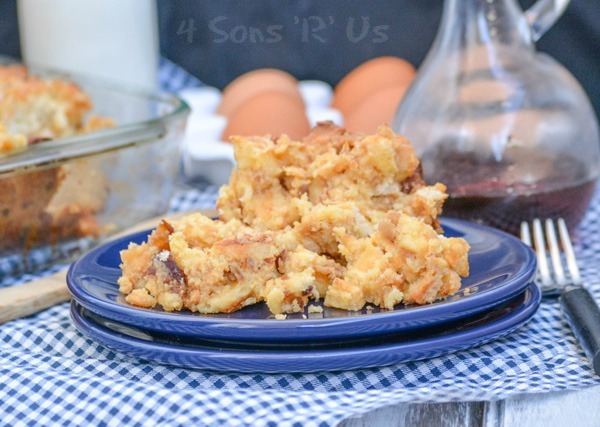 This Maple Bacon Waffle Bread Pudding has a little bit of something for every one. 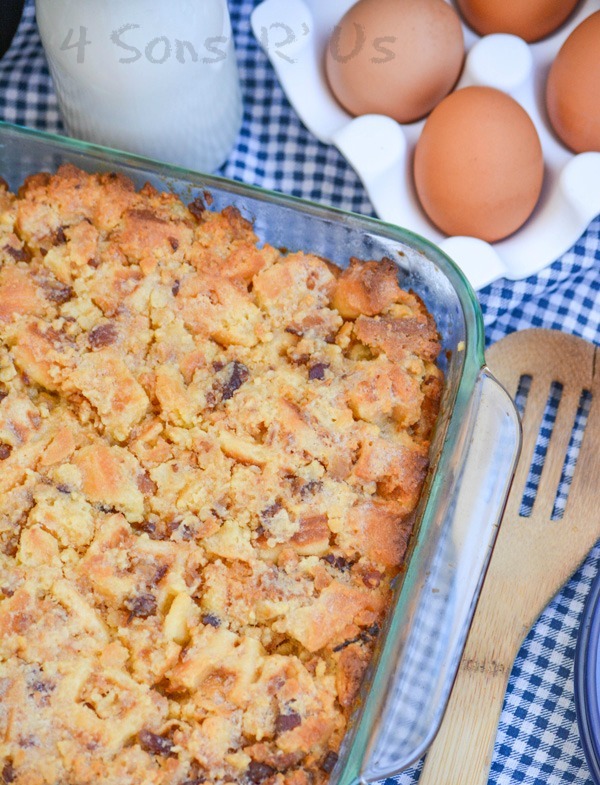 A sweet and savory breakfast treat, this bread pudding is hearty enough to be a filling meal-- or even dessert. Spread your waffle pieces out onto a baking tray, in a single layer. Bake the waffle chunks at 350 degrees for 15 minutes, to crisp them up nicely. This step is important, otherwise your pudding will be extra soggy. In a large bowl, stir together the yolks, milk, cream, syrup, vanilla and salt until evenly combined. Add in the chopped waffles and the bacon. Toss gently with a spatula until evenly combined. Let the mixture rest for 30 minutes, gently tossing every 5 minutes. Spray an 8x8" baking dish with non-stick cooking spray. Transfer the mixture to it and use a spatula to press it down flat and evenly into the dish. Cover the dish tightly with aluminum foil and bake at 375 degrees for 30 minutes. Remove the tin foil, and continue cooking an additional 20 minutes. Remove the dish fro the oven, brush liberally with the melted butter, and serve warm. Bacon has got to be the new condiment to everything!! 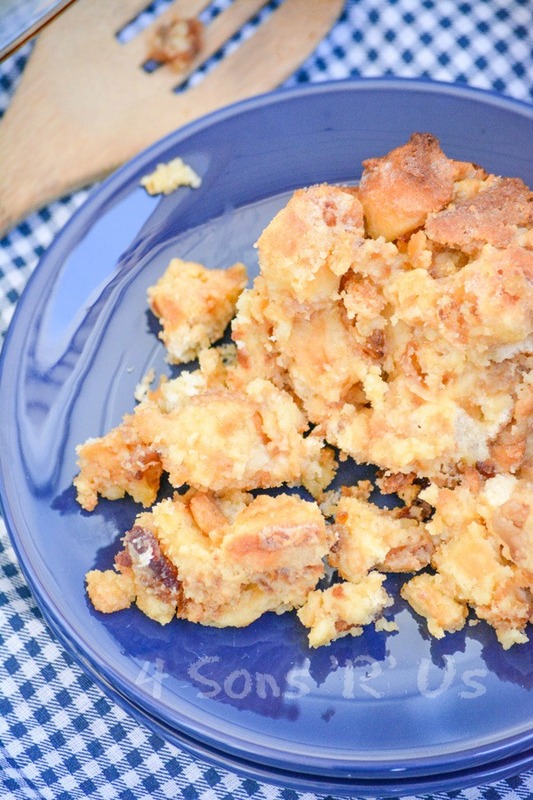 I love the other breakfast treats on the page, also, but this bread pudding is amazing! Thanks for sharing at Fiesta Friday! !